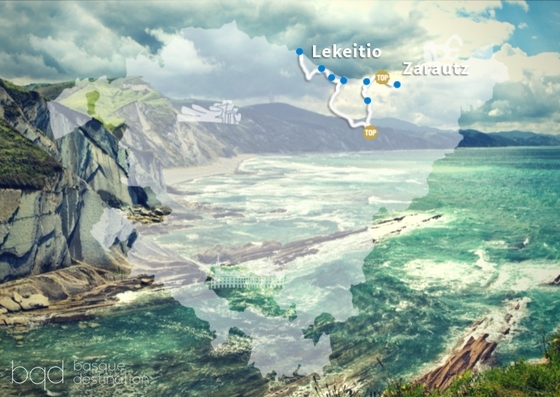 Would you like to visit The Basque Route? Take your car and dicover the hidden spots! You've got a date with water. You'll find it next to the Guggenheim Museum in Bilbao, you'll follow it until you reach a transporter bridge which is unique in the world, and you won't lose sight of it all day. You'll see it lapping on beaches, dancing around islands, crashing into wild cliffs, surrounding fishing villages and outlining impossible rivers. Welcome to the Bizkaia of the Cantabrian Sea. APPROXIMATE DRIVING TIME: 3h. aprox. What's on the menu? Fishing villages and delicious grilled fish. And for dessert? A (gigantic) baroque sanctuary nestled in the mountains. 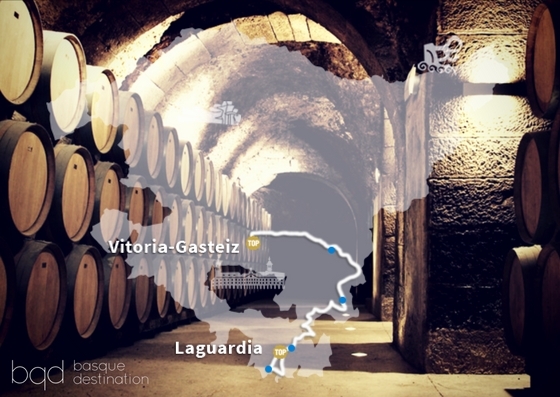 Ready to flirt with the green Basque Country? The mountainous Basque Country, the Basque Country hidden in the folds of the valleys, the Basque Country of lonely farmsteads. Let's go. First, you'll see the dawn over the Cantabrian sea, you're sure to have lunch in a valley, that of the Urola river, hidden between mountains and, finally, you'll have dinner near a hill shaped like a mouse. APPROXIMATE DRIVING TIME: 2h. aprox. Also today, we will stay by the sea. And we will visit locations recognised by the New York Times. And a place reminiscent of Venice. And some touches of the Basque grasslands. You're in Gipuzkoa. You'll know it because of the smell of fresh fish cooking on charcoal grills, the traces left by the Romans 2000 years ago, a town whose pintxos caused the New York Times to fall in love and another town that looks like Venice but is enclosed by a fjord. Yes, you're in Gipuzkoa, in the land of the famous Bella Easo and La Concha beach that everyone longs for. APPROXOMATE DRIVING TIME: 2h. aprox. "Txotx! 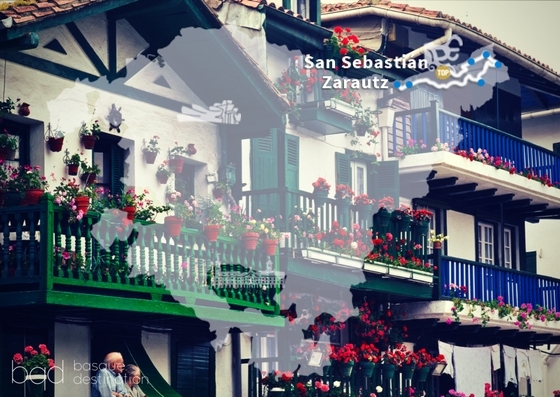 ", "sagardoa", "babarrunak", "gazta"… edible Basque words that we'll hear today... but what do they mean? In the Basque Country, "gero arte" means "see you later". Therefore, say "gero arte" to the sea because you're heading to the Basque Country seen on postcards, that of the meadows and beech forests, that of cider houses and raised glasses. You'll be lucky enough to meet a majestic mountain called Txindoki, a couple of medieval towns and perhaps even a hundred-year-old market. The finishing line is Vitoria-Gasteiz, the "green" city. APPROXIMATE DRIVING TIME: 3h. 35' aprox. Is it possible dive into a sea of vineyards? We'll have to try. Where? Rioja Alavesa. That's where we're headed. There is a Basque Country far from the clichéd view, and today you'll get to know it. Are you ready to drive through wide dryland fields? Ready to discover a dolmen among sunflowers? And, are you ready to jump into a sea of vineyards? A walled town awaits you, as do wine tastings in underground wineries and the most surprising architecture in our land. APPROXIMATE DRIVING TIME: 2h. 50' aprox. It is not easy to leave Rioja Alavesa, not at all. To alleviate its memory, you'll enjoy a surprising panorama of the Ebro valley, discover a salty landscape and a couple of waterfalls to take your hat off to. You'll also see the source of a river that you first saw a few days ago: the Nervión, which meanders through the centre of Bilbao on its way to the sea. APPROXIMATE DRIVING TIME: 2h. 10' aprox. From Santurtzi to Bilbao? (as the folk song says) Yes! Along the river? Nearly. 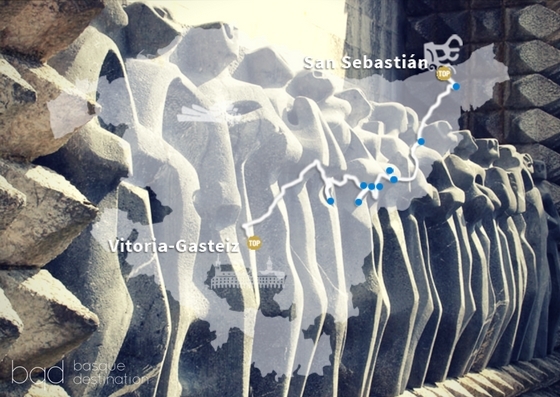 But first, we'll discover some of the Basque Country's most noble stones and villages. That's right! APPROXIMATE DRIVING TIME: 3h. 10' aprox.